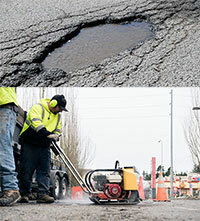 In the Northwest pavement will develop cracks eventually due to the rain and freezing temperatures, however, it is much easier to fix cracks when they first appear, than after they expand into a pothole or destroy your entire parking lot. Also, cracks and potholes allow water to reach the pavement's base which can weaken and destroy large sections quickly if not addressed. Without a stable foundation, the pavement can't support the weight of traffic, which frequently leads to alligator cracking. Asphalt repairs will involve the removal of the damaged asphalt and foundation repairs. Sealcoating and crack filling your pavement is one of the best things you can do for it to increase the longevity. Sealants can double the pavement’s life, and as an added bonus, they can drastically improve its appearance. Sealcoating can be done from spring to fall, although it is best in the summer as temperatures need to be above 50 degrees with no rain and the UV rays help to cure the sealant faster. 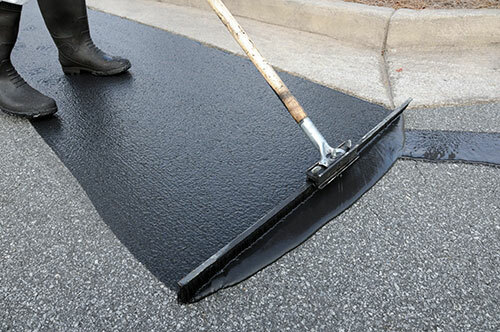 Most asphalt pavements need to have sealcoating applied every 18 to 42 months, but your exact schedule will depend on factors such as the traffic your pavement receives and the preparation of your lot. Sealcoating protects from UV rays, oil leaks, and chemical deicers. Asphalt also needs to be cleaned as the vehicles that drive on it leak fluids and these fluids can deteriorate asphalt pavement. Sealcoating does slow the penetrations of the fluids to help protect the pavement, but it is not 100% effective. Clogged storm drains or catch basins can force runoff back onto the pavement, which can cause surrounding pavement to deteriorate. If water cannot drain from your pavement, puddles can form, and standing water increases the risk of water penetration and foundation damage. Sweeping with a regenerative air sweeper is the most environmentally friendly ways of maintaining large areas regularly and keeping the contaminates out of our local waterways. Cleaning the particulates up as they are scrubbed by tires will stop future deterioration and extend the life of your parking lot as well. Sweeping and pressure washing are easier and more effective the better the surfaces are maintained. 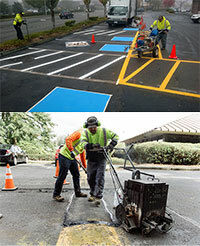 Restriping is necessary to comply with ADA compliance and striping can further increase the curb appeal and usability of your lot if maintained properly. Brightly painted curbing, parking stalls, pedestrian crossings, and other pavement stencils make your area both safer and more attractive. A great looking parking lot will continue to bring customers into your or your tenants business's year after year. 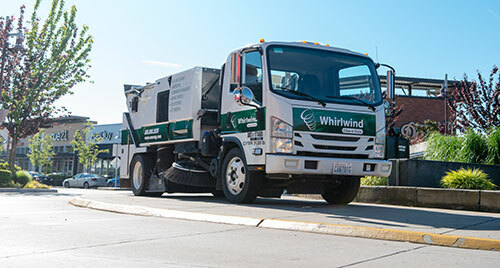 Whirlwind would like the opportunity to help you maintain your parking lot or garage, please call or email us today to set up an appointment for a free estimate.